1. Prepare bowl with water and lemon juice to submerge hearts, preventing discolouration while preparing remaining hearts. 2. Chop the stem off at the base of the globe, leaving 2-3 cm of stem. Peel outside bracts until you reach the inner bracts. Cut off the top 1/3 of the artichoke and trim the base, leaving the heart with only the tender inner bracts. 3. Cut the heart in half. Scoop out the hairy choke with a teaspoon. Immerse the heart into the water and lemon mixture until you have prepared all artichokes. 4. Remove hearts from liquid and place into a bowl. Tip the liquid into a saucepan and add salt, peppercorns and garlic. Bring to the boil, then add artichoke hearts. Bring back to boiling point, reduce heat and simmer for 2-3 minutes. Ensure that the heart does not overcook. 5. Remove from hot liquid and cool. 2. Place artichoke halves on a baking tray and sprinkle with lemon juice. 3. In a bowl, add breadcrumbs, parsley, garlic, cheese, bacon, salt and pepper and mix well. Top artichoke hearts with breadcrumb mixture. 4. 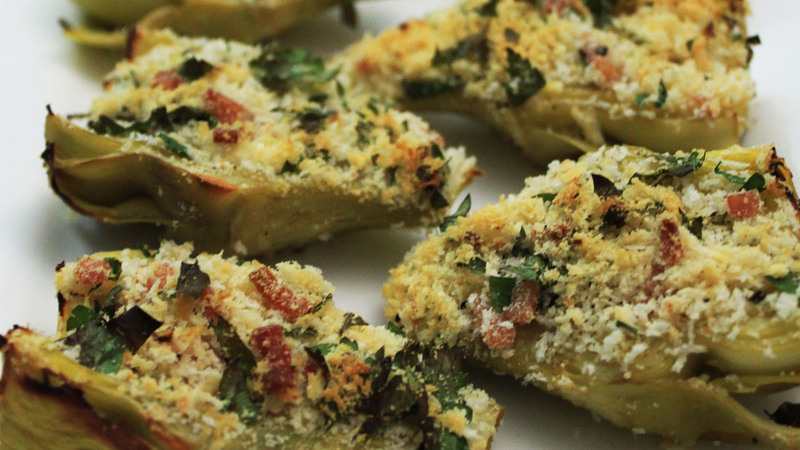 Bake artichoke hearts in oven for 20 minutes or until slightly golden.